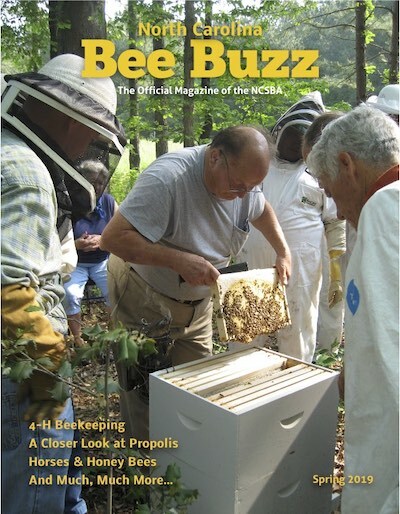 The Bee Buzz is the official quarterly magazine of the North Carolina State Beekeepers Association (NCSBA) and is included as a membership benefit in hard copy or digital format. It provides current and relevant information on beekeeping, beekeeping-related happenings in the state, including statewide conferences, beekeeping schools and educational opportunities, news and updates from individual chapters, and a means by which individual beekeepers and bee-related businesses can dispense information about their activities, either through submitting articles or by paid advertising. The Bee Buzz often features articles about honey bees and beekeeping by in- and out-of-state experts, including experts within our own membership. We enthusiastically accept article and photo submissions! Please send us your articles and photos of news and information you’d like to share about your local association’s latest events, successes and failures, a biography on a long-standing NCSBA member you would like to honor, or a young beekeeper you’d like to see highlighted. All honey bee-related topics will be considered for publication. While we regret that we cannot always include every submission, we will do our best to print as space permits. Submit your article in .doc or .docx format. Photos should be high quality jpg or tiff format. Please include a caption for photos. Do not embed captions in your photos or photos into your news article, but submit these as separate files.